I thought I would give you a glimpse into the Hallowe'en that I grew up with as a child. I have seen from meeting other artists and seeing their work that they have a different background to refer to than I do. That's an obvious statement because what we grow up with is what we see as the norm; how it is done everywhere else. I read the feature article about my work in Artizen Magazine and this sentence jumped out at me, "His interest in fashion, costume, and set design would come as little surprise to anyone viewing his creations, but he lists,as well, stage magicians and magic props as favourites, and even includes candy, French pastries, fireworks, and shoes among his inspirations." Growing up in Victoria as a boy, fireworks were Hallowe'en! When my wife and I were in Switzerland this last summer, I had a book shipped to me from England called "Firework Art". It is an amazing book filled with page after page of vintage firework graphics; posters, box lids, and fireworks casing designs. 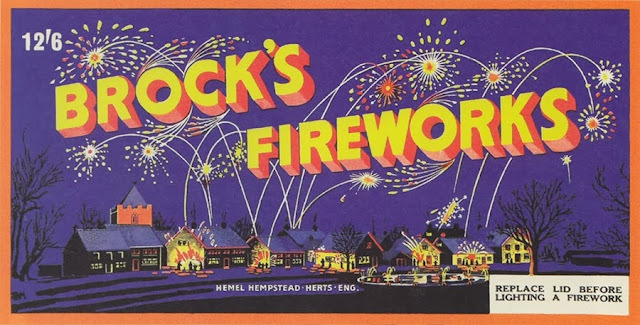 My next post I'll show you some examples of the vintage labels used on the old British fireworks. 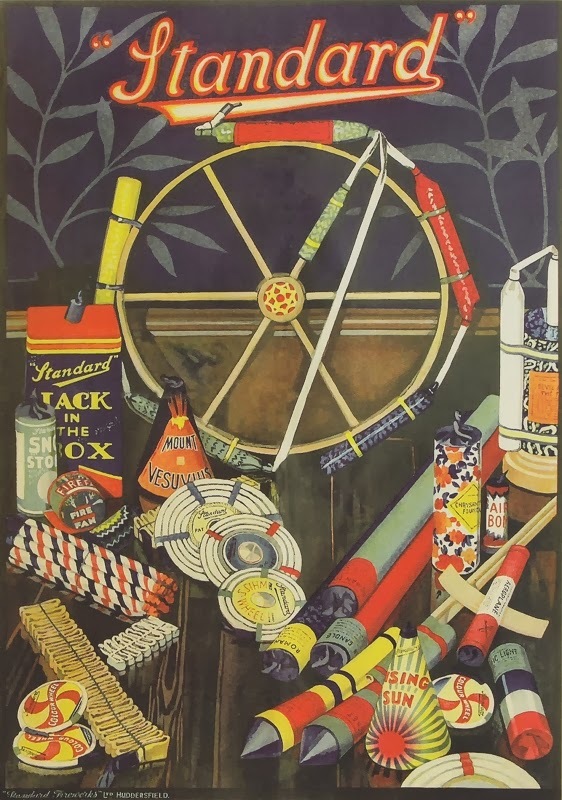 This poster from the book "Firework Art" shows what Hallowe'en was like in Victoria, B. C. when I was a boy. The British poster is advertising fireworks for Guy Fawkes Day, November 5. Victoria was advertised to tourists around the world as "a little bit of Olde England." I considered myself British first and then Canadian up till my early twenties; my grandparents were English, my mum was born in London. I suppose there was cross pollination between Hallowe'en and Guy Fawkes Day. 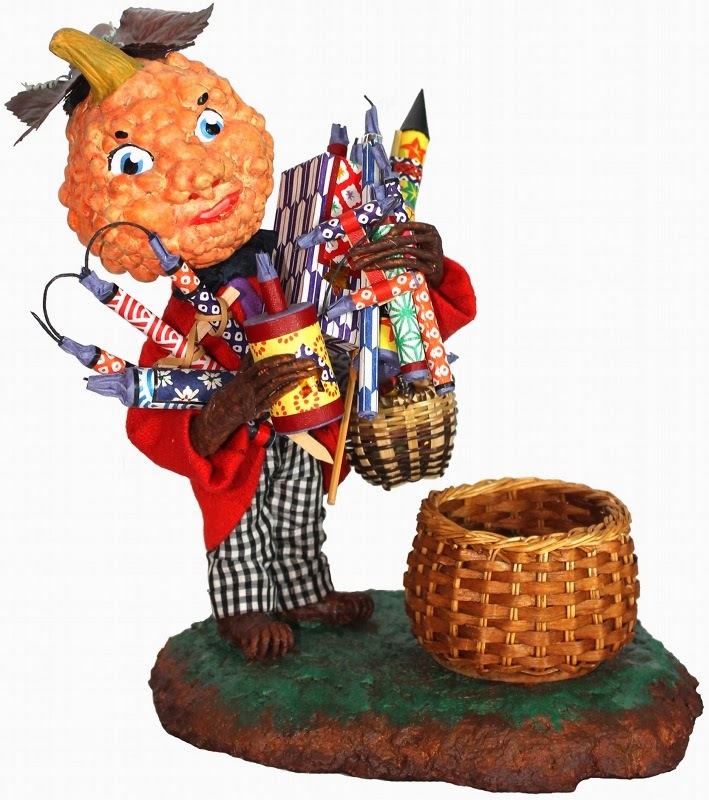 Hallowe'en was trick or treating and fireworks; fireworks were before pumpkins and anything else. 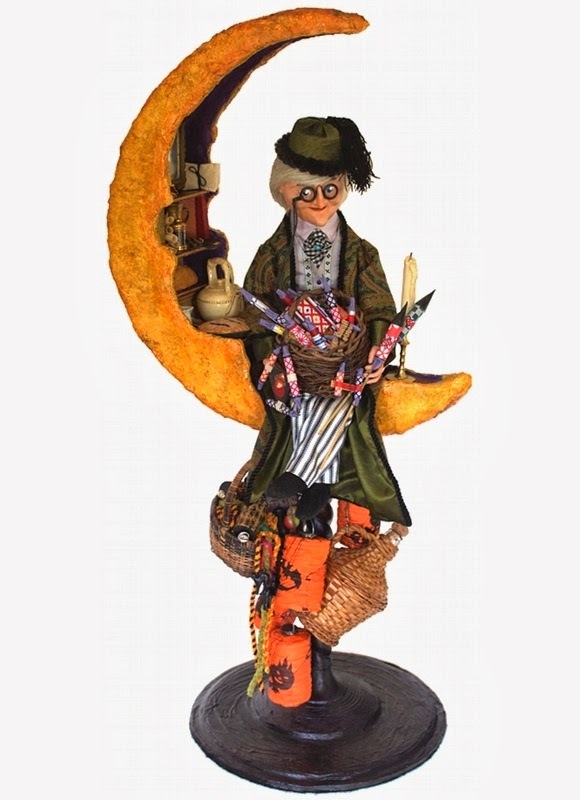 My sculpture, "The Man-in-the-Moon Will be Having a Party", shows some of the items for the forthcoming party with the fireworks taking centre stage. Check it out in my Etsy shop. The week before Hallowe'en was full of anticipation. We bought our fireworks and Chinese firecrackers, carefully taking them out and enjoying them and then safely putting them back in the paper bag that came from the shop that they were from. 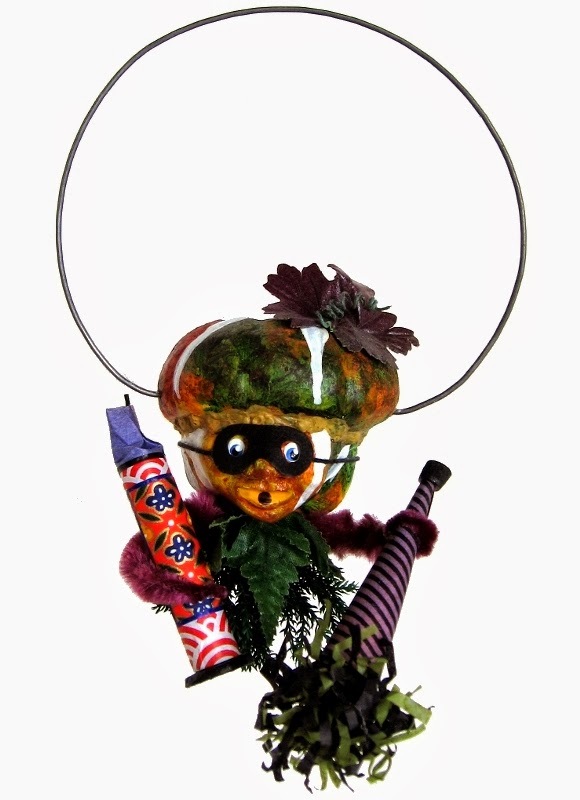 The sculpture, “Fireworks for the Party… and Some Apples” totally embodies the Hallowe'en of my childhood. 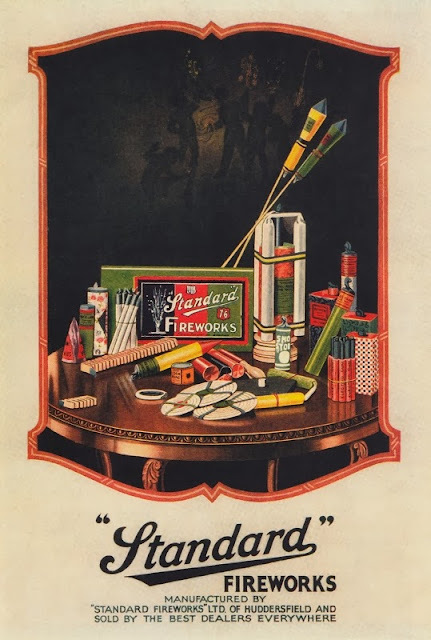 I love the old designs of the fireworks; the shapes were interesting and the designed papers covering them were beautiful. The fireworks that I build for the figures are based on the old designs but are more elaborate. "Fireworks for the Bonfire" has Larry holding his party horn and a large firework. 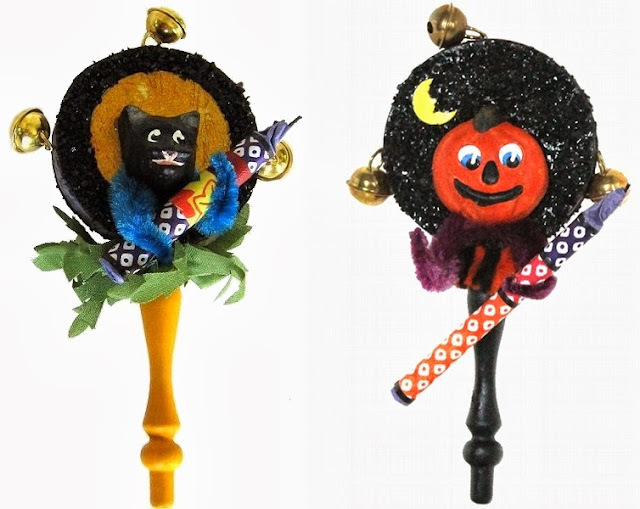 These two small rattles, one with Black Cat, also known as BC, and the other with Jack, have each character holding a firework. Check out these rattles and others in my Etsy shop. HAPPY HALLOWE'EN FROM HAPPY HOLIDAYS!